Greg Sterling, our mod, says SoLoMo is an amorphous category and can be difficult to discuss as it’s always hanging. 50+% of people access social media sites through handheld devices. Social and mobile are connected, and local is where all transactions happen — people use mobile to navigate the world at their fingertips. The three go together, albeit awkwardly. To resolve the awkwardness, our panelists. Gregg Stewart (@greggstewart) starts. Mobile has gone local. One out of 5 desktop searches have local intent. 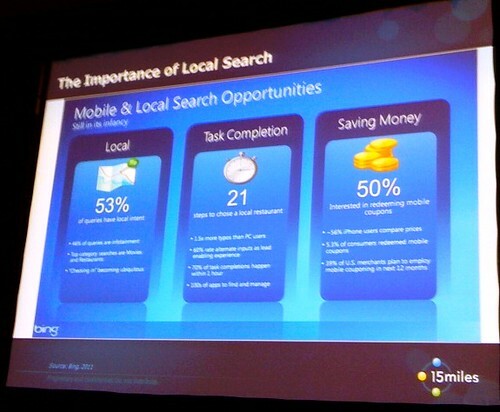 One in 3 mobile searches has local intent. As far as the intent of a consumer using a mobile device with social and local utility, 50% want to get coupons. A study from 2010 of consumers using sources to find local info and content, the numbers show clearly that cell phone and mobile devices have the highest YOY growth rate. Facebook is accessed on a mobile device 1/3 of the time. Mobile users have 2x usage. Ways that social networkers find local biz info: personal recommendations and ratings and reviews – these are significant areas we can address as marketers. What’s connecting these disparate areas? The listing identity. Claiming and optimizing local listings leads to additional visibility in local search. Nearly half of social network searchers select a local biz based off of consumer ratings and reviews. Google has changed the ways they list ratings and reviews in SERPs. They’ve deemphasized third-party sites for their own content. However, there’s been no change in importance, just not as prominently displayed. Ratings and reviews paradox: Only 23% of consumers have ever submitted a rating or review online. Only 6% are active reviewers. Special offers and promotions: Consumers are actively searching for deals online. Local social media connects to each other and “ready to buy” consumers. 7/10 social network search goes on to make a purchase. How do you measure this? Gib Olander (@golander59) is next. He’s the data guy. At Localeze, they’re the fundamental piece of biz listing data on the Web. This is the most exciting time for development of apps at the SoLoMo intersection. 6.8 billion people on the planet. 5.1 billion own a cell phone. Only 4.2 billion own a toothbrush. In the SoLoMo environment, timing is everything. New relevancy signals for marketers, advertisers ad search engines are driven by “when” a search or social check-in takes place. SoLoMo is getting personal. Increasing at the local level, our friends’ recommendations are apparent. Also, services are taking home-based check-in history and presenting similar types of bizes in search results when you visit new destinations. This makes it very important for marketers to upload meta info into listings services. Establish your online identity, it anchors customer experience. Claim your listing or your identity won’t exist across SoLoMo. Security & listings hijackers: over last 12 months, 11,000 unauthorized attempts to claim biz listings in Localeze database. 24.9% came from IP addresses outside U.s. 85% attempts were hanging category to service-to-home. Take ownership of your listing. If your identity isn’t established, you don’t exist. 83% of online shoppers say they’re interested in sharing info about their purchases with people they know. 90% of consumers trust recommendations from people the know and 70% rust the opinions of unknown users. 45% of consumers say they have products/services in mind, but don’t conduct a local search for specific bizes. They’re considering multiple bizes and are willing to be marketed to. Word of mouth is #1 influence on electronics (43.7%) and apparel (33.6%). 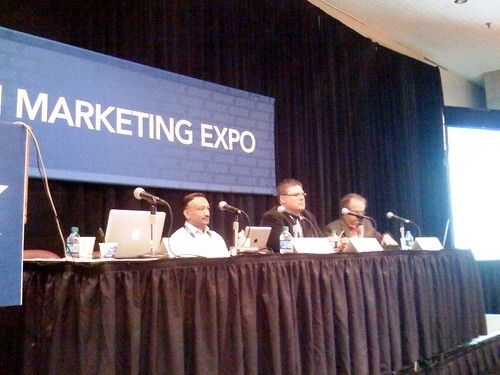 Siva Kumar (@siva_v_kumar) will talk about social-local-mobile and shopping search and product commerce. Tablets already provide 10% of shopping online. TheFind is a shopping search engine. It crawls the Web, extracts info about products – including social signals, classifies he data and maps it to a feed. Social signals are very important to them because a shoe product page can have hundreds of Facebook likes and only 3 inbound links. 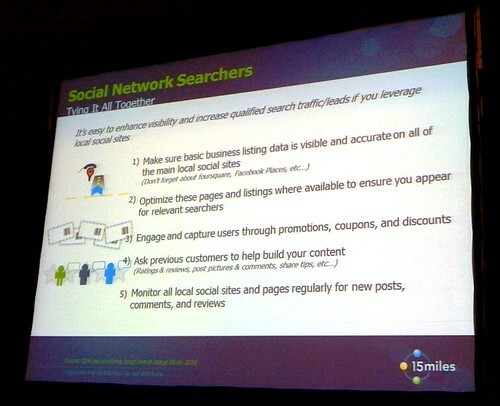 The social signals provide more data, which a search engine likes. The Internet today is made up of people + relationships. Likes of products, brands, stores and by friends. Likes influence CTR. Stores with greater than 100 likes see 7-8% higher CTR. It’s important to note that social has a strong influence on search rankings. Conversion rate is 125% higher when a user sees their friend endorsing a brand/product with a Facebook like. Whoa!